A vessel sink becomes a focal point of your bathroom instead of something tucked away under the vanity. Vessel sinks are an opportunity to add color, texture, and contrast to your bathroom. You also can keep it simple if you don’t want to draw too much attention away from other details. Neutral style vessel sinks, such as white porcelain or glass, can be paired with just about any faucet that is compatible with your sink’s height. That’s the purpose of this article: to look at many different styles of faucets you can pair with your vessel sink. You can get creative with the placement of your faucet and style choice, which is a significant step towards making your bathroom eye-catching. How can a faucet enhance your vessel sink? There’s more to a faucet than just color or material. 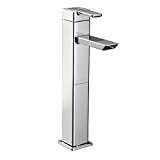 You can have waterfalls, levers, single handle, two handle, aerated, touchless, LED colored water, and many variations of all these things. If you’re looking to take the plunge and get a vessel sink, then take the time to pick a great faucet! Our starting point is how the faucet will be installed: wall-mount, counter-mount, or all-in-one (faucet mounts into the sink). These categories cover the majority of hardware you will run into, but there is always custom installation that might be a hybrid. Here are some examples to illustrate these styles and you can skip to a particular section that interests you. Must consider wall space and mirror placement when mounting. Requires additonal plumbing inside the wall. Best for remodel or new construction. You must carefully consider the vessel sink height and countertop height when installing. Be sure the faucet is high enough to fit over your vessel sink. These are the most common type of vessel sink faucet, and are easy to install. Easiest to install, and sometimes these are packages together with a vessel sink. You only need a hole in your countertop for the sink itself. I recommend starting with how you intend to mount your faucet. The way you plan to mount your faucet and sink helps narrow down the vast selection of vessel sinks and faucets. Whether you’re remodeling or building a new home, you will need plumbing built into the wall for wall-mount faucets. Things are simpler for counter-mount or sink-mount, but you will need to pick out either your faucet or vessel sink first. 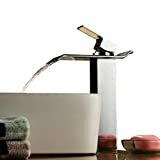 Maybe a particular faucet style interests you and you want to find a great sink to match it, or vice-versa and you want to see a faucet that works with your unique sink. Either way, this guide will help you pick out the right centerpieces for your bathroom. You will need enough wall space to accommodate this style faucet, which means large mirrors will have to be mounted high enough to make room for the faucet. For example, if you’re vessel sink is 5 to 6 inches tall you can expect to mount your faucet at least 2 inches above it depending on the style. Then you will want an additional few inches so that your mirror isn’t sitting right against the faucet or control knobs. That makes for nearly 12 inches above your counter before you can mount a mirror. This is just an example, but keep in mind the height of your vessel sink and faucet when planning your vanity layout. Counter mounted is often called “deck mount” or “counter based.” You may run into different names for the other mount types. Whether you are building a new home or remodeling your current bathroom, your faucet and sink have a significant impact on your vanity design. This guide is organized by style and mount type. There is a wide variety of finishes, materials, and mounting type combinations. Ideally, unless you have the experience, you should hire a plumber to install your faucet and sink. Difficulty: HARD – Hire a Plumber. Wall-mount faucets require you to know what height the faucet will be installed relative to your vanity and vessel sink. Most vessel sinks are 5-8 inches tall. Your wall-mount faucet spout should be a minimum of 3 inches above the sink rim. Installing wall-mount faucets require you to build in the plumbing behind your drywall, so you will need to have determined the height of your vanity, height of your vessel sink, and then the height of your faucet. This video will give you a detailed guide to installing a wall-mount faucet for your vessel sink. Deck-mount faucets are easier to deal with since you only need to know the height of the sink. This is the most common type of faucet for vessel sinks. Many sinks often come packaged with a faucet, so you don’t need to worry about anything. You need to cut a hole in the vanity where the sink will be mounted; then you have the freedom to place the faucet anywhere around the sink. You don’t just have to put it front and center! Difficulty: EASY – Some skill required but is the easiest overall. Sink-mount faucets are the easiest since there is only one way to install the faucet onto the sink itself. 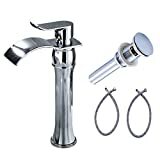 Often these types of sinks and faucets are sold as a single package. You aren’t likely to see many vessel sinks with this type of installation, but it’s good to be aware. Also, these sinks typically have an overflow port which is unusual for vessel sinks and is a nice feature. Wall-mount faucets require more planning. 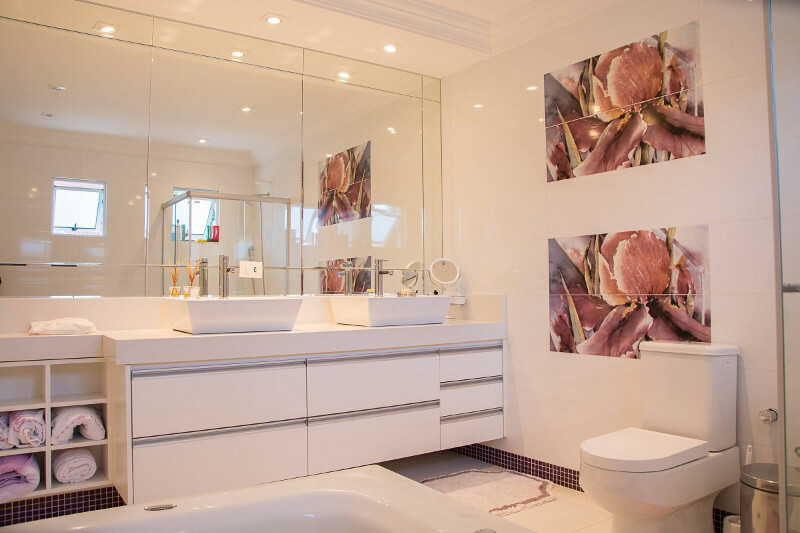 You will have to place your vanity mirror above where the faucet will be located, as well as plan the height around which sink you will be installing. These factors affect how high the faucet needs to be. Depending on the type of faucet you have, splashing can be a concern. Faucet placement and type can drastically affect splashing. Aerators significantly reduce splashing. By mixing air into the water stream, it reduces the overall volume of water exiting the faucet and limits the pressure. Aerated faucet streams look opaque white as opposed to clear. When picking out a counter-mount faucet, be sure there is enough room between the faucet spout and the bottom of the sink for someone to wash their hands. There is nothing worse than having your hand touch the bottom of the sink because there isn’t enough room under the faucet. This is the most common style. You have ultimate freedom in placing the faucet around your vessel sink. Depending on the depth of your vanity, you may want to mount your faucet off-center or favor one side over the other. Spout height is a critical measurement, along with knowing your vessel sink’s height. At a minimum your vessel sink spout must clear the top of the vessel sink, and you generally want a few inches of clearance between the spout and the lip of the vessel sink. Unlike Wall-Mount Faucets, there’s no extra plumbing in your wall. This also means a leaky faucet won’t be leaking inside your wall. 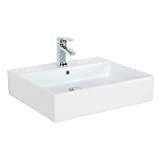 More freedom in placement of your vessel sink and faucet on your vanity. More options; there is more variety with Counter-Mount faucets. Installation is much simpler than Wall-Mount. Depending on the tools you have available, you could install a Counter-Mount Faucet yourself. These are the major reasons counter-mount faucets are most common in residences. It’s just easier to deal with. Unless you’re building a new home, then wall-mount is a lot of work, and you’ll likely need to hire a plumber. If you want to remodel your outdated bathroom, then a counter-mount faucet and vessel sink is a great place to start. Picking a “best” faucet is meaningless since there are so many different reasons to choose a particular faucet or sink combination. It must fit your bathroom’s counter space and match your decor. Here we’re going to look at some of the top ranked models with a variety of styles. 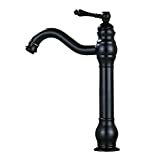 You can view the specifications and diagrams for this Delta faucet here. Delta is a well-known brand in the plumbing and household fixtures category. We have found some budget models that have positive reviews, but going with a well-known manufacturer with a long warranty is a good idea when this hardware is going to be between your home and potentially hundreds of gallons of water. Below is an example installation. The spout height is generous and gives you some flexibility in placement and the style of vessel sink you can pair it with. As you can see, on smaller vanities the backsplash clearance can become an issue. 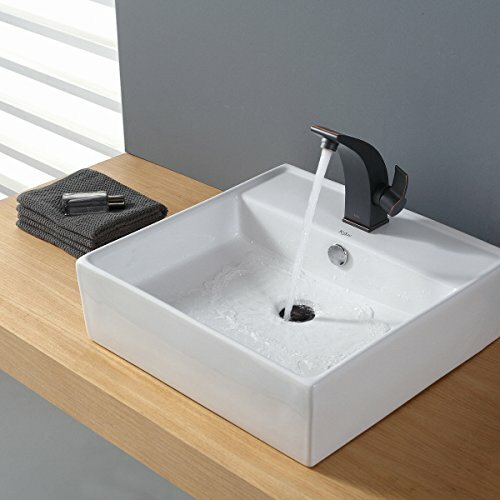 With vessel sinks you have a ton of freedom as to where the faucet and sink are placed. In the example above, you could easily have installed the sink closer to the backsplash and moved the faucet off to one side. Keep in mind that you will likely want to install your vanity mirror above the height of the faucet. Wood framing or trim, cabinets, or other things that might interfere with handles need to be addressed when you consider placement of your faucet and sink. Next, this faucet from BWE is one of our budget picks. The body is made from brass with a zinc alloy handle, so you shouldn’t have to worry about any rust. The spout height is slightly higher than the Delta faucet above. The style of this BWE faucet is modern, whereas the Delta we looked at above is more old fashioned. However, with the oil-rubbed bronze and copper finishes available on the BWE you can still get an antique look if the price and measurements are more fitting for your needs. 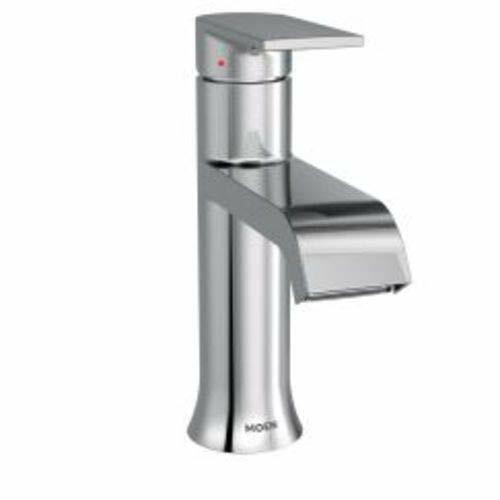 If you like the contemporary look, we’ve got another top pick from Delta that has a sleek waterway spout with a streamlined body. Pop-up drain assembly sold separately. After seeing these examples, you might be wondering which style works for you. The vessel sink concept itself if a throwback to the old wash basins and stands that were used before modern plumbing existed. Now, of course, that doesn’t mean they don’t fit into a modern bathroom. In fact, you can find vessel sink and faucet combinations that maintain that antique style, or have a super streamlined modern look. It’s all about the shape, color, and textures that you choose. You’ve seen some of our top picks, but below we’ve got additional options in this category that are budget-friendly. There are four options for the finish on this faucet: brushed nickel(shown above), chrome, gold, and oil-rubbed bronze. The package includes the faucet, 15.7 inch long hot & cold water hoses, 3/8″ female compression thread, mounting hardware, and matching pop up drain. It also has the industry standard ceramic disc cartridge. Depending on your plumbing setup you may find the hot & cold lines are not long enough and you will have to purchase longer ones separately. Some vessel sinks will not work with the drain inserts provided with this faucet. The drain included has a large hole for an overflow line, but vessel sinks do not have an overflow port, so you may have to purchase a different drain. However, often vessel sinks will come with a drain so you may not have to buy anything extra. This faucet style has gained popularity lately. With vessel sinks, this style needs to be tall because there is no arc in the spout. Water drops do tend to stay behind after using this faucet. Wiping out the faucet spout when you clean your sink area can help avoid buildup. For people with hard water, you will notice mineral spots on the open spout. There are a few different finishes available for this faucet: brushed nickel (pictured above), Bronze, and White. One of the biggest complaints with this faucet is that water pools in the spout. Some people care, and some people don’t. An exposed spout will show some water stains; it’s unavoidable. Check out the next faucet which has a bit more angle to the spout and is the same style. This widespread waterfall faucet gives you a similar stream as the Beelee shown above, but with the closed spout top. However, to maintain the pristine chrome shine, you will still have to wipe it down. That’s to be expected with any sink and faucet. The spout length shown here is from the back of the spout to the front. This can be misleading since that doesn’t mean the spout overhangs 7.5″. The overhang from the front of the faucet base to the end of the spout is about 3.5″. 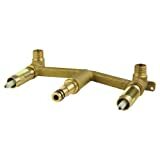 If you need US standard 3/8″ threading, then you will need to buy hoses separately. The spout for this faucet is a bit on the short side at 7.2″. You’ll see many of the other waterfall faucets shown here have a spout that sits about 9-10″ high, which is an important factor during planning the installation. Most vessel sinks have a height of around 5-8 inches. You can’t use this faucet with an 8″ tall vessel sink. The spout reaches 3.6″ inches out from the body of the faucet, which is typical. It would be a good idea to mount this faucet as close to the vessel sink as possible to ensure you have enough hand room. One important feature of this faucet is the aerator. It’s more noticeable when you turn the water pressure on high, but it mixes air bubbles into the water which helps reduces splashing. It effectively reduces the volume of liquid that comes out of the faucet by replacing some of it with air bubbles. Aerators are extremely common, but you may have never noticed the difference. There are 5 variations of this faucet: antique brass, brushed nickel, chrome, gold, and oil-rubbed bronze. The high-arc faucet is commonly used for undermount sinks, but there are also models available for vessel sinks with a wide variety of styles and finishes. 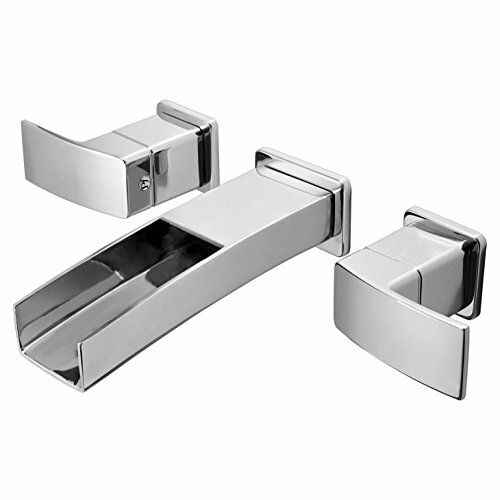 For vessel sinks, they generally only have a single handle that is made at or near the top of the faucet. 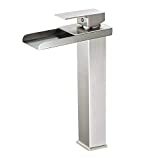 This is because the vessel sink extends several inches above the vanity deck, and you wouldn’t be able to reach the handle if it were mounted like a typical undermount sink and faucet. The Moen Align 6192 is a modern minimalist design that doesn’t drive the focus to itself, but instead can help accentuate your unique vessel sink, or be the finishing touch on a minimalist-themed bathroom. 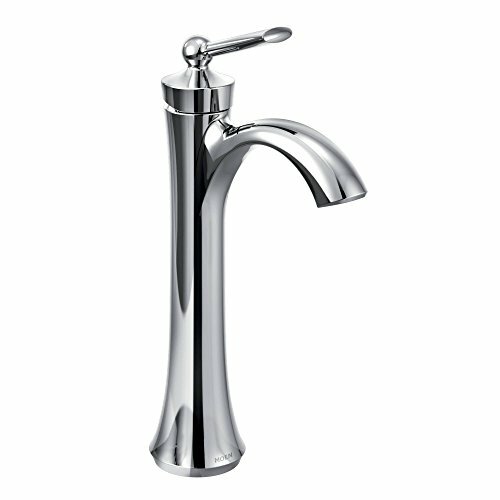 If in doubt, a simple vessel sink faucet like this Moen can match with just about any style vessel sink. White porcelain and glass are popular styles paired with steel or nickel faucets. More natural styles, such as teak wood or bamboo, pair well with waterfall faucets with a channel spout. The chrome finish on the Wynford works well with any decorating style. 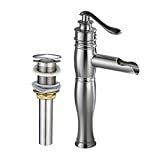 The water aerator in this faucet helps reduce splashing when washing hands or rinsing your toothbrush. If splashing is a big deal for you, then any aerated faucet is likely going to be better than some of the more popular types, such as waterfall. You just don’t see aerators on waterfall faucets, usually. The style of this faucet is ultra-contemporary, and minimalist. This faucet also meets the EPA WaterSense standard which conserves water without sacrificing performance. As for installation, you can use 3/8″ compression fittings with flexible supply lines and is designed to be installed through a single 1-1/8″ diameter hole. The flowrate is limited to 1.5 GPM at 60 PSI. This is slightly higher than other “eco-friendly” faucets that are usually around 1.2 GPM. Brand New with Box,Highest quality,Factory direct sale,Lowest Price. This is the first faucet listed here that has a swivel neck. It’s a nice option that gives you more freedom in where you place the faucet relative to the sink. It also has one of the longest spouts of any faucet listed here, which extends 7.5 inches out from the faucet body. Valve is included, but the drain is not. There are a few finishes available with this faucet: antique brass, brushed nickel, chrome(shown above), and gold. 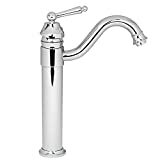 This faucet is similar to the Heindure shown above but has a shorter spout reach at about 5.5 inches. The overall height (12.6″) and spout height (9″) are about the same. This faucet does not have a swivel spout. There are a few different finishes available: antique brass, brushed nickel, oil-rubbed bronze(shown above). Wall-mount faucets range from antique brass to ultra-modern waterfall. You can expect to have to mount the handles separately from the faucet spout. This requires some patience to get them placed just right. Wall-mount faucets require the most work and planning to install, but they bring a unique aesthetic to your vanity. Perhaps it’s something about the permanence of having the faucet built into the wall, which also adds a touch of minimalism. So you’re considering a wall-mount faucet, and maybe you haven’t quite decided on a vessel sink either. When picking your faucet, you want to make sure it doesn’t clash with your vessel sink. What does that mean? Let’s say you have a beautiful teak wood vessel sink and you’re trying to pick out a faucet. A chrome spout faucet doesn’t complement the natural look of teak wood. A waterfall faucet carries forward the natural feel, so you could start there. Perhaps you are looking for a faucet to complement a copper or bronze vessel sink. There are many Victorian-style vintage bronze or brass faucets, such as this Kingston Victorian, that go very well with metal vessel sinks. If you’re looking for a more high-arc Victorian style, then there’s this Kingston Brass Vintage faucet. If you have a very neutral vessel sink, such as clear glass, then you have a lot more freedom in choosing a faucet. 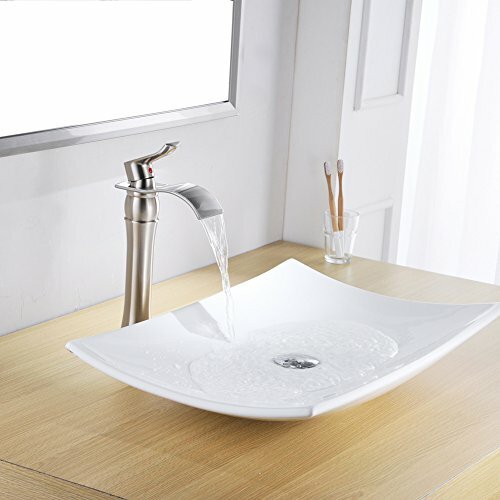 Remember, a vessel sink becomes the focal point of the bathroom, so picking out a fun and unique faucet can make all the difference, especially if you have a simple, clear glass vessel sink. Waterfall faucets make it seem like there’s a natural spring running through your house, though hopefully much cleaner. 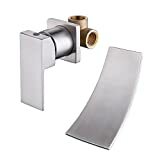 There are a variety of waterfall faucets, but they generally seem to have either an extra wide spout or a narrow spout. Check out these models below for some of the best wall-mount waterfall faucets. PREMIUM QUALITY: LEAD-FREE brass faucet body (less than 0.25% lead content) and stainless steel spout, ensures quality and longevity. WATERFALL SPOUT: 118 MM or 4-3/5-Inch wide water fall spout. QUALITY FINISH: Beautiful multi-layer brushed nickel finish, build to resist daily scratches, corrosion and tarnishing. Wall mounted, concealed installation, 1/2-Inch IPS, straight threads. The body is made of stainless steel and brass with a chrome coating. The valve is made with a ceramic disc cartridge. Ceramic disc faucets were originally used by high-end European faucet makers, but now they are standard with most American manufacturers due to being nearly maintenance free. They are not susceptible to mineral buildup or debris in the water line due to their diamond-like hardness. If you want to read more about ceramic disc cartridges check out this article. If you are a DIYer, then these measurements and directions should give you a general idea for placement of the faucet, but as always you should have a licensed and insured professional do any serious plumbing work. Step 1 – Drill, a 7/8” hole for the faucet and a 1 ½” hole for the on/off, handle. Place the holes about 7” apart from the middle of each hole and lower the handle by 1 ¼” from the faucet hole. For a 5 ¼” tall vessel sink, place the faucet hole 12” from the top of the vanity counter top. This leaves a 6 ¾” gap between the faucets 7/8” hole and the top of the vessel bowl. Step 2 – IMPORTANT: Unscrew the on/off valve and pay attention to the two small holes. The valve has three big holes and two small holes (the three holes are for the water to flow but the other two holes are to hold the cylinder in place. To install it correctly, the two small holes have to be on the top, otherwise, your handle will be backward, and you will have to redo your copper pipe soldering all over. Step 3 – Cut your copper pipes to fit from the on/off switch to the faucet. Important Notes: Please remove the on/off cylinder before soldering to copper pipes – DO NOT SOLDER WITH THE CYLINDER INSIDE OR THE FAUCET SCREWED IN THE COPPER PIPES. YOU WILL DAMAGE IT AND IT WILL LEAK. Q: Once installed, how far does the faucet extend from the wall? Q: My water pressure is too high, and water splashes out of the sink. What can I do? A: An inline pressure reducer may be an option for you. Alternatively, if there is an on/off valve for the hot and cold lines you can close the valves until the pressure is just right. Q: How far above the vessel sink should the faucet be mounted? A: About 6.5 Inches. However, there are several factors to consider: the diameter of your vessel sink, the distance from the faucet to your vessel sink drain, and your water pressure. Q: Can this faucet be used in a shower? A: No, there is no diverter valve to divert the water to a shower head. If you could install one inline with this spout, then it would work. 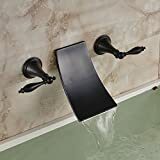 Can be installed for a sink or tub. One of our favorites, this faucet has very solid construction and has a limited lifetime warranty. The style is modern and sleek. It’s also water efficient and has an output of 1.2 GPM. With this type of waterfall faucet, the top of the spout is exposed to achieve the waterfall effect. However, if you live in an area that has hard water, you will find that mineral deposits will be visible as left behind water evaporates. You should be cleaning your vessel sink and faucets regularly anyway, but for some, it may be annoying to see what your water leaves behind. This faucet requires 3 holes for installation. It’s important to take the time to get the handles level with the faucet. This does require more effort than a 2-piece or the 1-piece faucet reviewed above, but you won’t be disappointed with this beautiful faucet. This is a similar design to the KES waterfall faucet I reviewed above but has the oil-rubbed bronze finish with 2 handles. For installation, you should be able to use similar measurements as the KES faucet. Since it requires 3 holes to install, you can expect a little more difficulty, and be sure to take extra time to make sure the handles are level with the spout. The spout is 4.52″ wide and extends 5.11″ from the wall. That means it extends about 1/2″ less distance from the wall than the KES faucet above. Installing a faucet on a pre-drilled sink is the easiest installation to do. 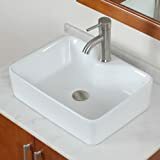 You only need to worry about where the sink is going to be placed on your vanity as the installation holes for the faucet are built into the sink. Many of the faucets we looked at above can also be installed on a sink. You have the freedom to mix and match, but there are faucet and sink combinations you can buy that do the work for you. Lastly, if you have a small vanity this might be the answer you’re looking for. Don’t have the room to mount the faucet off to the side? No problem, since the only space you need is for the sink. We’re going to look at a few package deals here, but you’re not stuck with these options! As the name states, this is a simple faucet/sink combo that you can install on a wall or a countertop as a vessel sink. This is true for any wall-mount sink that has a backside that is finished. Simply install it as you would a vessel sink, on the countertop. One positive thing about rectangular vessel sinks is that they’re easier to clean around. Having a bowl-shape sink means more surface area that you have to wipe down, and you have to make sure you clean the backside of the bowl. Faucet is made of Brass,and with Brushed Nickel Finish. Two holes are needed to install sinks and faucets of this type. One for the water connections and another for the drain. Since you’re removing much less countertop material than you would with an under-mount sink, you have a lot of flexibility for future upgrades without tearing out your countertop.